* Conceptual design subject to change. Art by Justin Baird. Each chapter includes a history of the rifle’s development and its intended use, along with information concerning known variants, production numbers, markings, disassembly and mechanical operation, bayonets, and a history of deployment and combat use. French small arms have played a unique role in global firearms development, often ahead of the curve and always unique. Supported by world-class color photography and printed to the highest standards, Chassepot to FAMAS is not just a valuable reference tool but also a beautiful book worthy of any discerning library. Ian McCollum is the founder, editor, and presenter of Forgotten Weapons, a decade-old web site and video archive dedicated to preserving firearms history. He specializes in French small arms and holds a deep interest in collecting these weapons. 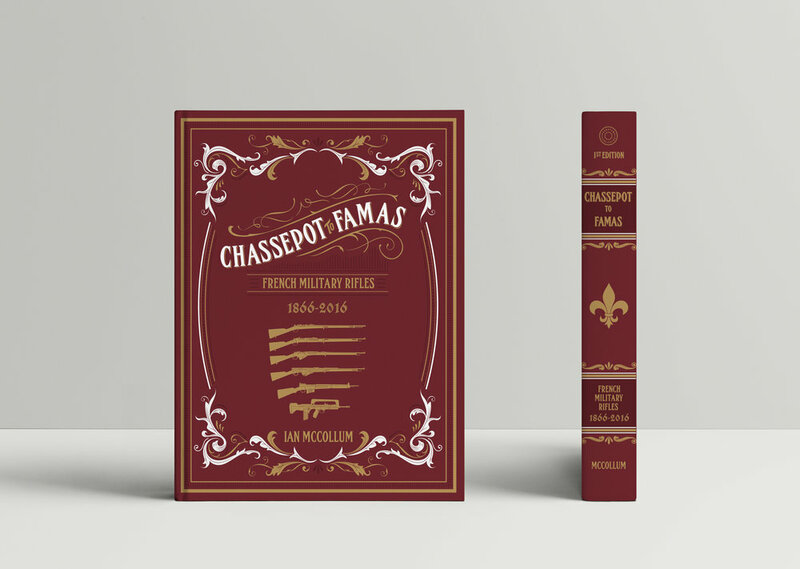 It is his hope that Chassepot to FAMAS will lay the groundwork for a new level of appreciation and respect for these historically important weapons. To receive news and updates on the latest Headstamp Publishing releases, pre-order opportunities, funding campaigns, limited editions, and much more, subscribe to our newsletter. Each chapter describes the weapon's conception, development, trial and intended role. Essential technical aspects of design and operation are framed in their historical context and the whole is laid out in a clear, logical, and chronological manner. These stories are lavishly illustrated with top quality photography of key examples from the world’s best collection of these exotic and poorly-understood weapons. As the contemporary debate over the relative merits of bullpup and conventional small arms builds pace, this work is a timely reflection on the efforts of the most prolific of the bullpup nations. Thorneycroft to SA80 is both a comprehensive reference work to support serious research, and an aesthetically pleasing illustrated publication for the firearms enthusiast. The Emir’s New Rifles: A History of the Kabul Arsenal, 1885 – 1920 charts the course of Afghanistan’s first and only modern small arms production factory. The reader will be transported back to the days of high adventure in this fascinating examination of key personalities, gun production, and firearms characteristics, framed against the backdrop of impressive feats of engineering accomplished in an austere and challenging environment. The book follows the Kārkhānah-i Bukhārī (‘steam workshop’) from its inception, through its high-points, to its gradual decline and demise after the First World War. Photography of the highest standard accompanies the text, allowing readers to pick out minute detail in unprecedented quality. Headstamp’s access to the world’s best collections of these rifles has been supplemented by field research in Afghanistan and archival research around the world, making this the definitive book on the topic. In recent years, firearms produced at the Kabul Arsenal–often mistakenly identified as Pakistani ‘Khyber’ copies–have proven popular mementos for ISAF troops and others deployed to Afghanistan. The Emir’s New Rifles offers collectors, curators, researchers, and enthusiasts an unprecedented understanding of this little-known factory and its unique firearms.